Joint Entrance Exams or JEE as they are commonly called is the entrance examination conducted by the Central Board of Secondary Education. The exam is the gateway to the students aspiring for Bachelor’s Degree in the field of Engineering in the prestigious colleges in India. Currently, the exam is conducted in two phases, JEE Main and JEE Advanced whose scores are reviewed for admissions into NITs, IITs and some other institutions like the Indian Institutes of Science Education and Research(IISER). So without second thoughts, the examination is probably the toughest to crack due to the difficulty level of the questions. And with increasing number of aspirants, the competition just gets fierce. A lot of preparation and hard work is required if you are to fare well in these exams. Although there are several websites and books to help you practice well, it is always better to have Mobile apps for aiding your preparation. 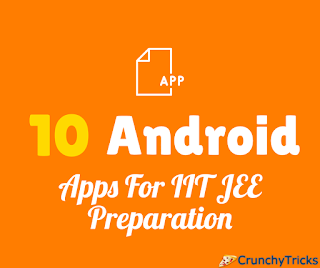 Here are 10 Android Apps for JEE Exam Preparation. JEE Main Prep by Minglebox is a comprehensive guide for fulfilling your JEE dreams. It covers the entire syllabus for Mathematics, Physics and Chemistry and rightly provides the apt amount of questions and support materials. Also, there are mock tests and question banks about each topic. To provide valuable tips and inspirations, there are lessons by IIT/NIT toppers. The app is completely free, and it has good reviews from successful students. Be a Toppr app has outstanding notes and well-organized summaries of every chapter for a quick review and understanding. It has over 250,000 questions for Physics, Chemistry, Mathematics and also Biology. You have assessment tests where the app adapts to the difficulty level based on how you solve the questions. You can ask your doubts with experts and get a personal mentor for you. The app is free. The mock tests let you compare yourself with other aspirants so that you know where you stand. Smart Test prep is for JEE and AIPMT examinations. It has questions for Physics, Chemistry, Mathematics and Biology. For every question, there is step by step explanation. Mock tests, notes and other supporting materials. You can choose each of the individual chapters and opt for multiple choice questions and reasoning questions. The content of limited chapters is available for free. This app is a compilation of many of the previous year questions that have appeared for JEE examinations. This app functions offline and has questions with answers for Physics, Chemistry, and Mathematics. Solutions of JEE Advanced exam is also available in the app. The positive side of the app is that it is fast and works offline. However, for an extensive preparation, the app may not be useful as it has only a few questions and solutions. This app is handy for revision and coaching test preparations. It has all the important concepts and formulae in compact form for a quick review. There are over 40,000 practice questions and 800 videos to make the concepts clear. With crisp points, the app will be good for the last round of preparation. It contains all the basic NCERT textbook concepts about Physics, Chemistry, and Mathematics. IIT JEE Preparation & Coaching app is ideal for students who rely more on self-study. It has free solutions to many of the major reference books and practice materials. There are materials for advanced topics and tests at All India level with detailed performance analysis and reports. All your queries are cleared by expert IITians and experienced faculty. The app is well recommended with good reviews. This app has questions of the AIEEE examinations from the year 2005 to 2012 and for all the JEE Main and JEE Advanced examinations from 2012 onward. It has all the necessary and essential books by famous authors that will give clarity to the concepts that you are learning and also throws light into important questions discussed in those books and the pattern of questions. You can prepare accordingly by giving more importance to individual chapters that weight more marks. PCM Formulas is more of a handbook containing all the relevant formulae in Physics, Chemistry, and Mathematics. It has other pertinent information such as the periodic table for a quick reference. The methods have been categorized under different chapter names and new formulae get added from time to time. It is handy for your CBSE Board examinations and also the various Entrance Examinations that follow. The app contains a lot of videos that explain every concept in the subjects Physics, Chemistry, and Mathematics in a concise manner. These videos are from IIT faculties, so there is no compromise on the quality of the lectures. There are 700 plus videos in the app. So you can install it and get clear concepts of the basics and then solve the questions. Even if you don’t have enough time left for preparations, you can take the video lessons as a virtual crash course. Infinite IIT JEE has the questions organized chapter wise for the major subjects, Physics, Chemistry and Mathematics. There are daily tests with new questions, and the students can analyze the score and compare it with others who took the test. This can help them know how good they are competitive. The solutions to the questions are not very detailed, so you must be possessing good background knowledge so that you can grasp every step in the explanation. Since JEE is known to be the toughest nut to crack, preparing well for it will help you in clearing other State level entrance examinations with good scores. And apps will be of great help to students as they can carry it around everywhere and not waste any valuable time. They have many advantages as you can calculate how much time you spent on questions, analyze the difficulty levels and assess yourself well. Above all, the apps are cheaper compared to buying a bulk amount of books or materials from other sources. Although it is advisable to have a few other books and the apps can be useful supplements and would provide you an edge over other students. Good luck!